Now that you are looking for the ideal denture to get the smile you always wanted, is necessary to talk about mini implants. What is a mini implant? What is it made of? Everything you need to know about mini implants you will find here. The main difference between mini implants and regular implants are the size. Mini implants are a few millimeters wide, and thanks to their small size they can be inserted into areas where regular implants are not an option. They are made of the same Grade 5 titanium alloy than regular sized implants. Grade 5 titanium is excellent for use on dental treatments for its bio-compatibility with both human bone and tissue. Are you looking for an affordable solution? Mini implants are the one because are more affordable than regular dental implants! Also, regular implants cannot be placed on a jaw and maxilla with low bone volume, but mini implants are a real alternative in most cases. The procedure needed to set the mini implants is a small surgery, making it easier and quicker for the bone to heal and keeping the implant in place. These mini implants have been approved by the FDA to be used in many types of dental treatments. The main use we give to mini implants is for anchoring the Snap in Dentures. While a single regular implant might have to withstand alone the pressure forces of biting and chewing, we place 8 mini implants along the arch of the maxilla or jaw bone to distribute the pressure weight from using the snap in dentures. This allows you to have a steady and secure bite without having to worry about messy denture adhesives. The mini implants success rate is very similar to that of regular implants. You must clean the dental implants as well as with regular teeth to fight off the plaque with a soft brush over your gums. 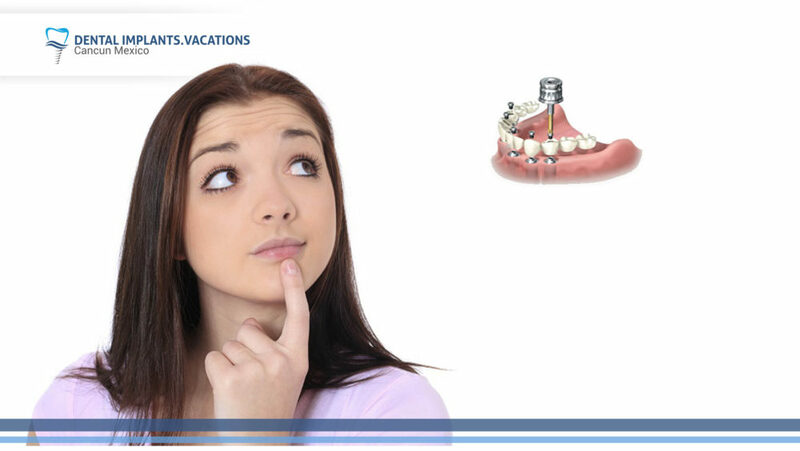 You should also stop smoking as it can have adverse effect on the integration of the implant. The Doctor will give you all other additional indications to make sure the mini implants will stay in place. If you have any doubts about the mini implants or you are interested in knowing more details, we offer you the possibility to go to a first consultation of free valuation. We invite you to call toll free from USA and Canada 1 800 701 6039 and tell us your doubts or if you are already on vacation in Cancun and want to meet us, you can call us for an appointment at the following local number (998) 140 51 25. Make sure to like our Facebook page to know about our promotions or if you want to watch more about other patients reviews we invite you to check our Youtube page.